Bill Knight died on January 17th, 2019, 87 years of age. He had been sick for a long time and was, quite frankly, bored with it all. He had spent a rewarding life as a husband, father, and news photographer of the highest caliber doing what he loved with those who he loved. Born in Los Angeles on September 3, 1931 to Bert and Viola Knight, Bill grew up as the quintessential Angeleno, graduating from Dorsey High with only one goal in mind to be a press photographer in Los Angeles. His first decade was spent as both an outdoor and general assignment photographer for the Daily Mirror, the afternoon edition of the Los Angeles Times. He then graduated to television news, and after a freelance stint at KCOP, found a permanent home as a news cameraman at KTLA. Over the next 35 years, Bill was definitely Old School. He started his career as a still news photographer and migrated to the new kid in town, TV. 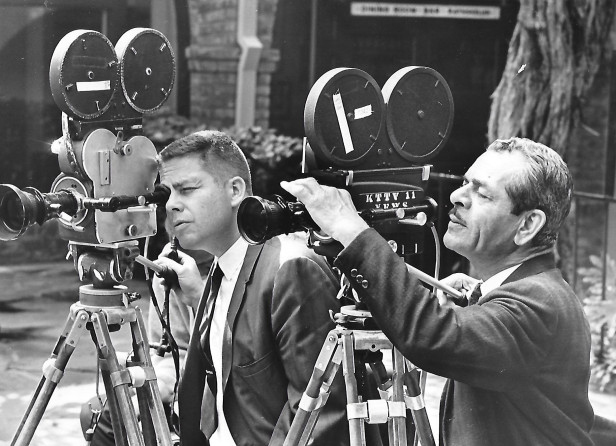 Bill made the transition from still to movie film to Electronic News Gathering. Bill’s career was a mirror of the history of Los Angeles. From the assassination of Robert Kennedy at the Ambassador Hotel to the Rodney King Riots and more, he was there. A vigilant witness for the people to the happenings of his city, he often said that the camera was the only honest observer, never lying and always optimistic. He was proud of both his work and his colleagues. His association with the Press Photographers Association of greater Los Angeles (PPAGLA.org) was profound, serving as President three times while spending over 60 years supporting efforts of news photographers in Los Angeles. He was the consummate and concerned professional. He was President in 1971,1990 and 1991. Bill served as Vice President in 1970 and 1976 and as Director from 1977-1982. He spent nearly a dozen years on the Board of Directors in some capacity. Bill won the annual TV Spot News category so many times that the Association lost count. When Bill retired he funded the Bill Knight Endowment which funds the Video Spot news category. Bill was part of the effort to move the monthly Board of Directors meeting from the Press Club Bar to a more suitable location. As is turned out alcohol-free meetings actually were more productive. He even hosted meetings at his home with his wife, Betty providing the meals. Bill always showed encouragement to the youngsters coming up the ranks. He made friends with still photogs as well as video shooters. Former Los Angeles Times staff photographer Rick Meyer says that “Bill pigeoned-holed me in to running for the Board of Directors and then told me I was to be the Treasurer, even though I was just a year out of college. This was back in 1975 and I’ve been really involved with the organization ever since.” Bill was the cornerstone of the organization. Retired Fox 11 reporter Tony Valdez says, “Bill Knight taught me most of what I know about being a broadcast journalist.” In the late 1970s, Tony was the reporter assigned to KTLA’s Photo 5, one of only two news crews the station had during that era. With soundman Bob “Zimmy” Zimmerman, they covered stories all over Southern California. Bill, with his CP16 camera, loaded with Kodak color film, made every shot count. Film was too expensive to waste on shots that would never make air. Back then, most TV news reports were about a minute and thirty seconds long. 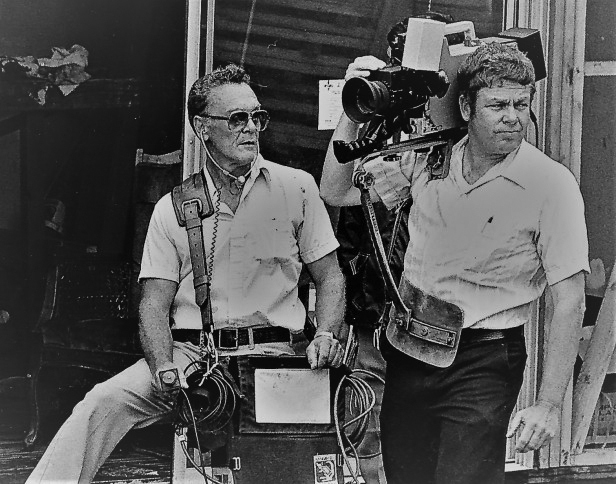 Bill never shot more than five minutes on any story. Wherever they went, Bill had his scanner on, monitoring police and fire frequencies. His ears were tuned to anything that might turn into a Code 20 event. Code 20 was LAPD’s term for a newsworthy event. Bill was an exemplary husband and father. Married since 1965 to his partner and soul mate Elizabeth (Betty), they raised two children, Kathyrne and Christopher. Bill had a love of the outdoors and nature that he shared through both his work and in his private life. In his retirement, his great joy and partner in all things silly was his six-year-old granddaughter Lily, the perfect foil for an 80-something who never stopped being a kid at heart. In addition to his other grandchildren Sean and Maegan, Bill is survived by daughter-in-law Susan and son-in-law Don. His son Christopher Knight said, “He was as honest as the pictures he took and his love and respect for the outdoors is why I’m a naturalist and scientist today. He was a hunter, fisherman, and objective witness to the changes in the ecology of California and I was there to learn from that. It was good stuff. I will miss him surely but he will always be there when I’m in the field, under the water, or being a father. I will definitely see him out there. Interment will be private as per Bill’s wishes. In lieu of flowers, donations can be directed care of the William Knight Endowment Fund at the Press Photographers Association of Greater Los Angeles.